A splashy restaurant from a world-renowned chef, overlooking Center City from the 59th floor, with a lounge one floor above. New restaurants from other decorated chefs (though three projects on the way from Michael Solomonov and Steve Cook have no timetables). A beer hall in University City packed with arcade games. A plush sushi restaurant in Fishtown from a former Morimoto chef. Kosher pizza in Bala Cynwyd. Vegan pizza near Rittenhouse Square. The return of two burned-out restaurants (Bridget Foy’s at Second and South and the Little Lion at Third and Chestnut, both for fall). The Fashion District Philadelphia (the old Gallery) with three venues later this year. If my list of pending restaurant projects is any indication, 2019 will be another solid year for openings in the Philadelphia region. On the flip side, if the end of 2018 is also an indication, the openings will be balanced by more closings than in previous recent years. I predict slow overall growth throughout the region. The scene has become saturated with new restaurants, stretching the customer base and workforce. Also, restaurateurs who several years ago signed three- and five-year leases are being hit with sticker shock when they try to renew. Here are the highlights. As always, opening dates are elusive. It’s impossible for anyone — much less a wildly optimistic restaurateur — to predict the inevitable construction delays, licensing problems, and the occasional financial calamity. In this booming restaurant economy, delays are more pronounced as work crews are being stretched. Society Hill gets a pastry cafe from Aurora Wold, whose specialty is hand-painted chocolate. Open now. Rouge, which opened in 1998 at 205 S. 18th St., is closed until mid- to late February for a renovation. The bistro that launched sidewalk dining on Rittenhouse Square 20 years ago closed after business Jan. 1 for a dining room renovation designed by Meg Rodgers, who styled Rouge for Neil Stein. Design elements are being kept under wraps. The renovation is targeted for six weeks. Meanwhile, chef Sean McPaul, whose resume includes High Street on Hudson in Manhattan, is the new chef. His predecessor, Sam Noh, will help chef Michael Yeamans at sister restaurants Audrey Claire and Twenty Manning Grill until he moves out of town. Fiore, 757 S. Front St., replaces Kanella South with Italian stylings. Decorated New York chefs Ed Crochet and Justine MacNeil take the former Kanella South with a “casual-ish, but not overly casual — professional at the same time” Italian restaurant open from midmorning (pastry, etc.) through dinnertime. Due in early January. Danny Digiampietro sets up his now-shuttered Haddonfield pizzeria in the former Sarcone’s Deli, which closed in summer 2017. (His wife, Lauren, happens to be a Sarcone.) Due in early January. A mural by Kyle Confehr at Neighborhood Ramen, 617 S. Third St., before its opening. Jesse Pryor and Lindsay Steigerwald, whose experience includes Cozara, Cheu Noodle Bar, Morimoto, and Zahav, are setting up a Queen Village storefront with ramen they’ve mastered after research trips across the United States and to Japan. Forget about takeout or delivery; they insist that their delicious ramen must be consumed on the spot. Due in mid-January. Cira Centre South's parking garage on 30th Street near Chestnut Street will house The Post, a beer hall (denoted by arrow). Walnut Street Cafe’s Branden McRill fronts a beer hall on the ground floor of the Cira Centre South parking garage. Lots of beer, arcade games, and bar food, including an ice cream sundae bar. Due in mid-January. 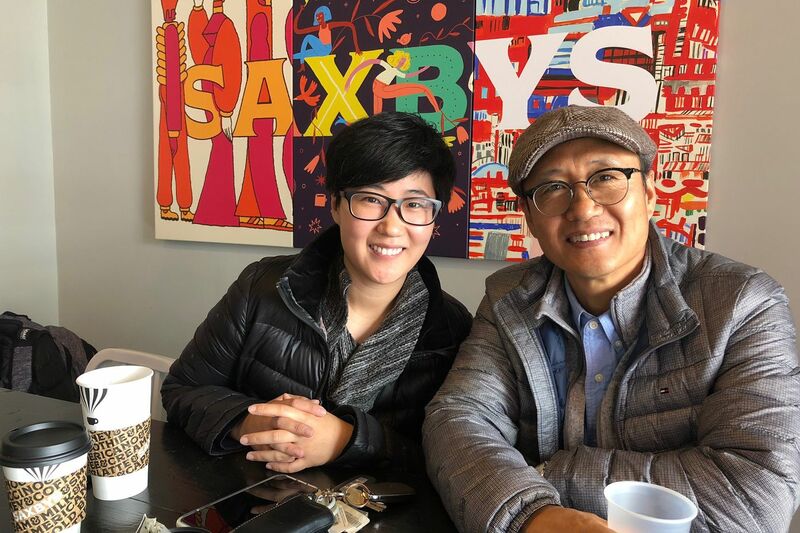 Father-daughter duo John and Jennifer Choi, riding high with a seasonal Korean fast-casual shop called Crunchik’n in Ocean City specializing in Korean fried chicken, will open a second location in the short-lived Ugly Duckling, with much of the same menu — but with one addition: oven-baked (not fried) Korean-style chicken. Due in mid-January. Alpen Rose, a steakhouse from Michael Schulson, under construction at 118 S. 13th St. on Dec. 28, 2018. Michael Schulson’s steak house, next to his Sampan and Double Knot, will be a snug 40-seater with house-aged meats and a grown-up vibe. Due in January. A branch of the Korean fried chicken chain is going into the basement at 4002-4004 Spruce St. in West Philadelphia. Includes a bar. Due in January. A bruncherie by Joncarl Lachman (Noord) in the former More Than Just Ice Cream. Due in January. A light and breezy seafooder with a serious wine list from the creative team behind Mistral (Princeton and King of Prussia) and Elements (Princeton) comes to Fishtown/Kensington. Due in late January. The casino sets up a drinking option. Due in late January. The company that runs the Bernie’s pubs is remodeling the shuttered Brewerytown Taproom in Brewerytown. Due in late January. The former Danlu in University City is reimagined as an American restaurant with Mediterranean influences. Due in late January. Restaurateurs Bridget Foy and husband Paul Rodriguez, awaiting the reconstruction of their fire-ravaged Bridget Foy’s restaurant at Second and South Streets, are partnered with David Gilberg and Carla Gonçalves — the husband-and-wife team that ran Koo Zee Doo, the critically acclaimed but now-shuttered Northern Liberties Portuguese BYOB — on this neighborhood-friendly restaurant. Due in late January or early February. A specialist in Japanese omakase from Morimoto veteran Hiroki Fujiyama, set up behind Wm. Mulherin’s Sons in Fishtown. Due in February. An Italian BYOB replaces the long-running neighborhood spot Sandy’s. Due in February. A 30-seat BYOB from chef Ari Miller. Due in February. Barbecue joins the bread baking and beer brewing at the former Yards brewery in Northern Liberties. Partly open now; rest should be open in February. Chef Bobby Saritsoglou (ex-Opa) and Christina Kallas-Saritsoglou have an Italian restaurant teed up for Point Breeze. Due in mid-February. Chef Adam Diltz will celebrate indigenous ingredients at his American BYOB in Fishtown. Due in late February/early March. Divine Lorraine Hotel, 669 N. Broad St.
Chad Rosenthal’s Ambler BBQ restaurant moves into a branch at 990 Spring Garden St., next to Roy-Pitz. Due in March. Four partners plan to offer “elevated, smart, simple food,” a solid bar, and a bottle shop in the back in Port Richmond. Due in March. Pizza guru Joe Beddia relocates his famed pizzeria to a larger space in Fishtown, where he picks up a bar and partners. Due in spring. The pub chain takes over Derek’s in Manayunk. Due in spring. An outdoor Mediterranean grill from the crew behind Morgan’s Pier, Harper’s Garden, Concourse Dance Bar, Parks on Tap, and Rosy’s Taco Bar. Due in spring. Greg Dodge is helping to create a kosher version of his Zavino pizzeria at 370 Montgomery Ave. in Bala Cynwyd. Due in April. Developer Jay Overcash says the family-style Italian restaurant, roughly modeled on business partner Greg Dodge’s Zavino, should be open by early May. Greg Dodge is outfitting a former paper mill for his third Tredici (after Center City and Haverford). Due in June. Michael Pasquarello sets up a Mexican-Chinese hybrid near his Prohibition Taproom and Cafe Lift. Due in summer. The healthful fast-casual smoothie/bowl/chicken specialist is going into the Franklin Residences on the 800 block of Chestnut Street. Due by summer, but we’ve heard this before. Four Seasons Philadelphia, 1 N. 19th St.
Globetrotting chef Jean-Georges Vongerichten opens a sumptuous restaurant on the 59th floor of the new Comcast Technology Center, with its Sky High lounge on 60. Due in mid-2019. Chef Greg Vernick, flying high with Vernick on Walnut Street and Vernick Coffee Bar in the Comcast Technology Center, goes the seafood route on the skyscraper’s ground floor. Due in mid-2019. Fishtown is getting a multipurpose Eastern European restaurant and performance venue. Due in mid-2019. City Winery, which will offer concerts, food and wine classes, private events, and dining in a city setting. Dallas BBQ, a branch of the New York barbecue outlet. Market Eats (get it? ), a collection of eateries through a partnership with Aramark next to Jefferson Station. Names include Chickie’s & Pete’s, Chick-fil-A, Oath Pizza, Burger Fi, Pei Wei, Freshii, and la Madeleine.